In their simplest form, derivatives can be thought of as insurance policies that protect their holders from financial uncertainties. For instance, an airline company would like to protect itself against large surges in the price of oil, or an investor who holds many shares of XYZ corporation might like to lessen his/her exposure to severe downturns in the stock price. To insure themselves against these events, they purchase derivatives. But, how should the derivative be structured? And what is the ``fair'' price for this insurance policy? In this course we will consider the discrete-time analogs of these and other questions arising in finance from the mathematician's viewpoint. That is, we will thoroughly and rigorously develop some important mathematical ideas found in discrete probability, and show how these concepts can be used to construct a discrete-time model in which we can explore questions appearing in finance. In short, one can view this as an advanced course in discrete probability that explores applications to finance. Random Walks: the Discrete-Time Version of Brownian Motion. Prerequisites: a keen interest in mathematics and writing proofs, Math 20/60 & Math 23. Some programming experience will also be useful. 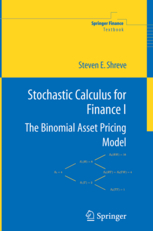 Textbook: Stochastic Calculus for Finance I: the Binomial Asset Pricing Model, Steven E. Shreve (Carnegie Mellon Univeristy), Springer 2004. (available at Wheelock Books). Deliverables & (tentative) Grading Guide: The following will comprise the written assignemtns for this term. Weekly Group Homework: This term you will form homework groups consisiting of 3-4 people. Your assignments should be written neatly and you should present your proofs and solutions using complete sentences. You are encouraged to collaborate with other memebers of the class, but your final write-up must reflect the understanding of your homework group. You must acknowledge any people outside of your group with whom you consulted. No late homework will be accepted.